To make the soused beetroot, firstly wash and trim the beetroot (keep the skins on). Wrap each beetroot individually in foil and place on a small pile of salt on a baking tray so that the foil is not in contact with the tray. Bake at 180C for 45 minutes to an hour. Allow to cool and then peel. Combine the orange juice, red wine vinegar, sugar and star anise in a pan and add the peeled beetroots. Bring to the boil, then simmer for 1 minute before taking off the heat. Leave overnight. It is now ready for slicing or cubing. Halve each of the Little Sussex Cheeses horizontally. Dip in the egg mix and coat with bread crumbs and then repeat. You can either deep or shallow fry until the bread crumbs are a golden brown colour. 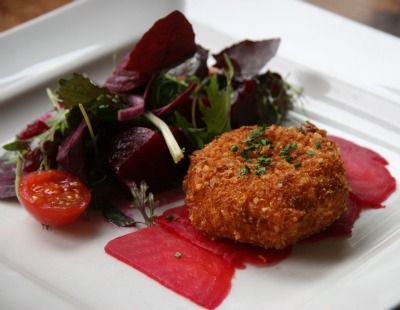 Serve on the sliced beetroot and a green salad with some cubed beetroot.